Want To Stand Out From The Crowd With Great Financial Content? Looking To Enhance Your Authority In The Financial Industry? Getting your financial content to stand out can be tough! With the deluge of content that your competitors put out, your financial content needs to be professional, it needs unique insights & fresh takes on current events, and it needs to rank! Writers with a “I just take what they give me” approach isn’t going to cut it – you need a true financial specialist. 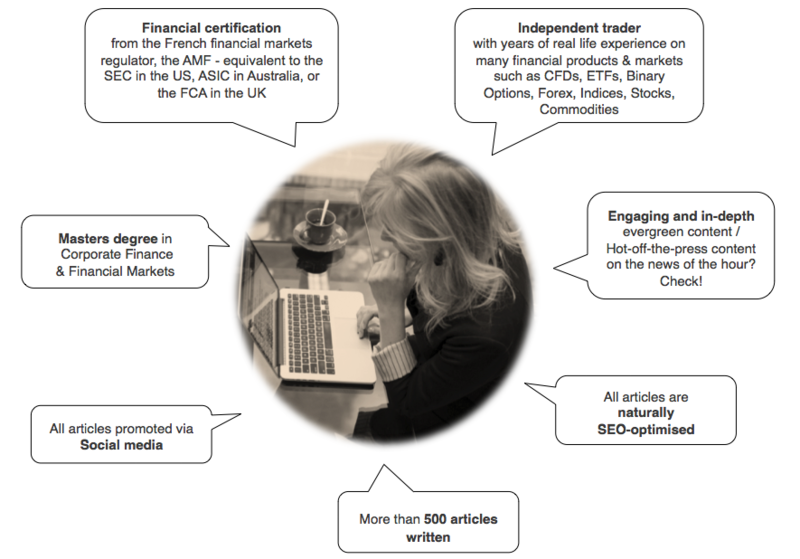 Which is exactly what we have, in the form of co-founder Carolane de Palmas, who personally writes each and every piece of financial content. Need content on forex, stocks, commodities, indices, cryptos, technical analysis, fundamental analysis, or CFDs? Carolane has you covered! Let’s discuss your financial content needs!